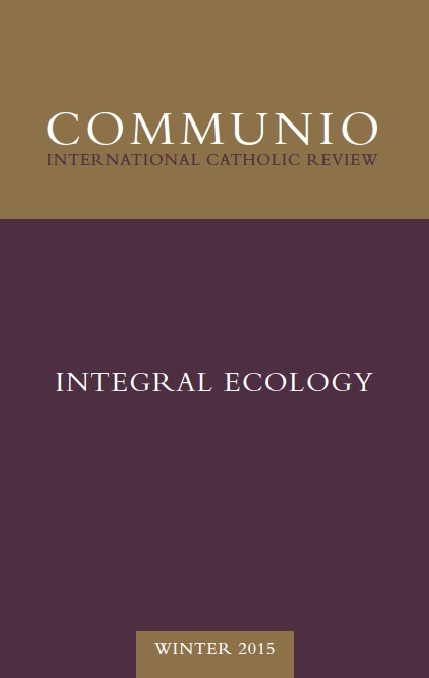 The Winter 2015 issue of Communio is dedicated to the theme of “Integral Ecology.” This phrase, characteristic of Pope Francis in his encyclical Laudato si’, reminds us that man is part of creation, but also its steward; and that the good of nature and the world, on the one hand, and the good of man, on the other, can never be separated. D. C. Schindler’s “Work as Contemplation: On the Platonic Notion of Technê” asks whether work has intrinsic meaning, or is only a kind of necessary evil. Drawing from Plato, Josef Pieper, and Matthew Crawford (philosopher-motorcycle mechanic), Schindler argues that “the meaning of the world and the meaning of man jointly come to expression in a decisive way in work.” Work articulates the metaphysical reality of man’s union with, and stewardship of, all of creation. However, we remain always in danger of reducing work to its merely pragmatic value, evacuating it of meaning and thereby obscuring the right relation between man and the world. Mary Taylor’s “Ecology on One’s Knees: Reading Laudato Si’” suggests that any attempt to read the encyclical through a strictly political, ecological, or economic lens misses its point: that the true key to reading reality itself, in all its beauty and grandeur, is the Creator God. Often recalling the vision of Dante, Taylor proposes that “the logic of ‘creation as gift’” is the encyclical’s radiant center foundational principle. In “Economics, Ecology, and Our Common Home: The Limits of a Preference-Based Approach to Human Behavior,” Patrick Fleming encourages a rethinking of some fundamental principles of the modern discipline of economics, in light of integral ecology. Economics, says Fleming, tends to measure well-being and success only in terms of material growth, and in abstraction from particular persons. Thinking economics in terms of an integral ecology, however, is “necessarily personal,” and would take into account the good of the concrete person, and hence also his household and local community. In Notes & Comments, Jesse Straight’s “The Coherences of Home: Life on Whiffletree Farm” provides a concrete picture of an integral ecology, starting with life on a small family farm. Straight explains that he directs and orders his farm according to two main principles: “(1) we try to humbly let nature be our guide and (2) we try to benefit all parties involved.” He insists on working with nature, emphasizing that the good of his land and his animals is intrinsically related to the good of his family and his customers. The two goods are never antagonists.